Yesterday we went out for brunch. It was nice but not a patch on breakfast at home today. 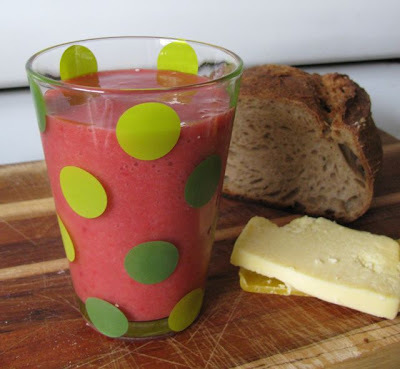 All it takes is an interesting smoothie, wonderful bread and good cheese. On the way home yesterday we stopped at Andre’s, a new local café at the entrance to Coburg Market. He has just started selling bread (just on Thursdays and Saturdays at the moment). We bought some caraway rye and it is fantastic! Dense, chewy and full of flavour. Finally, a local shop that sells excellent bread as well as great cakes. We also have some lovely mature crumbly cheddar that my mum brought for me at the Vic Market last week. Then a few nights back I made a rhubarb crumble. The actual crumble needs a bit of work before I post it but the rhubarb was fantastic. It was cooked with honey, orange and cinnamon. In a moment of wisdom I set some rhubarb aside. Into my blending jug went some rhubarb, berries from the freezer, dregs of a bottle of pomegranate juice and juice of the half orange lingering in the fridge. What a success. Both the rhubarb and raspberry flavours are rich and delicious with hints of orange, cinnamon and honey but not overly sweet. The colour is a deep and gorgeous pink. It is quite thick and icy. I first tried rhubarb in a smoothie last year when I had some leftover baked rhubarb. It was truly a revelation. If you haven’t tried it, I highly recommend it. All that was missing today was a dollop of my new favourite honey and cinnamon yoghurt. Next time! Blend (I used a hand held blender) and drink. 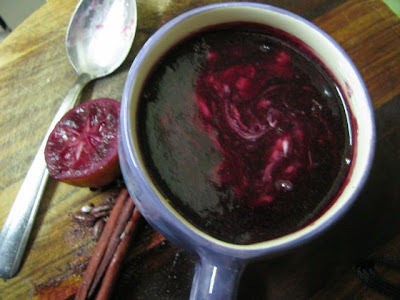 I have a new love and it is all due to being confused about ingredients needed for Wendy’s lovely blueberry soup. There are advantages to not checking a recipe properly! Rushing through the supermarket I was sure I needed yoghurt. Usually I either buy natural unsweetened yoghurt or fruit yoghurt. But I had seen a King Island honey and cinnamon yoghurt that seemed just right for a fruit soup. For those readers who aren’t Aussies, King Island cream is to Australia what clotted cream is to the UK. It is rich and delicious. The soup I was making was a Finnish soup called Mustikkakeitto or Blueberry Soup which I had seen on a Wee Bit of Cooking. Now I have only made one fruit soup before – a summery strawberry soup. What interested me about Wendy’s soup was that it was warm and spiced. Such a great idea as the nights gets darker and colder (and now that frozen berries are easy to buy). I added a few more spices than Wendy and it was quite rich. 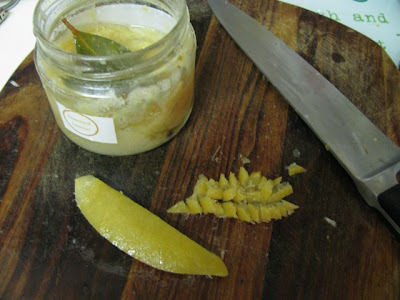 I also ignored her instructions to sieve it and thought I could take out the cinnamon and the clove studded lemon (from our tree – just the lemon, they don’t grow studded with cloves). Unfortunately my cinnamon stick was a little crumbly and we had a few little splinters appearing in our soup so next time I will need to sieve it (or put the cinnamon in a large tea infuser or muslin bag). I also used pomegranate juice rather than cranberry juice. 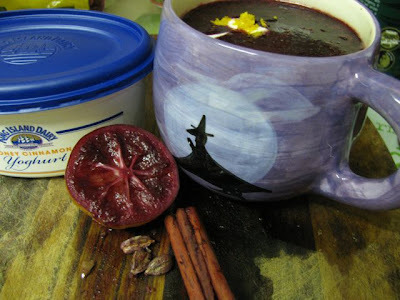 I love a mulled wine but don’t make it often and we don’t have cosy pubs with it like they do in the UK in winter. This soup reminded me of mulled wine with similar warming spices. (Which is why I couldn’t resist the temptation to add a slurp of cointreau.) Just the sort of thing to sip from a mug in from of an open fire and cup ones hands around the warm mug. Unfortunately we don’t have a fireplace so we have to sit in front of what E calls ‘the fireplace for the noughties’ – the telly! The blueberry soup was wonderfully rich and fruity. Half a cup could have done me. E only drank half his and then tipped the remains down the sink – I was most displeased with him! I had bought his a neenish tart from the Rathdowne Street Food Store earlier in the day. It ticked all his boxes – a pastry case filled with jam and buttercream and covered with icing. I suspect it might have ruined his appetite. On the other hand I was most pleased with my gloriously deep purple soup. Although, it wasn’t in Wendy’s recipe, I spooned some honey and cinnamon yoghurt into it. In my dreams I imagined sprinkling pomegranate arils across a white cloud of yoghurt but it seemed to too extravagant. Then I decided to grate orange zest over it but that came out in a clump. So in the end I think the yoghurt was all that was needed. I am not sure that the yoghurt made a huge difference so maybe I didn’t use enough. Perhaps a bit more would have helped cut through the richness a little. So we are back to my new favourite honey and cinnamon yoghurt. I was pleasantly surprised with how delicious it tasted. Refreshing and not nearly as rich as King Island cream. You may have noticed I have been quite partial to honey of late. But I did fear it would make the yoghurt too sweet. I must confess I loved this yoghurt so much that I ate the remains of the tub later that night. It was just so good. I have never liked cream on my desserts but am now finding that I need a dollop of this yoghurt on fruit desserts or perhaps with a piece of cake. Expect to see more of it on this blog. Press the cloves into the peel of the lemon half. 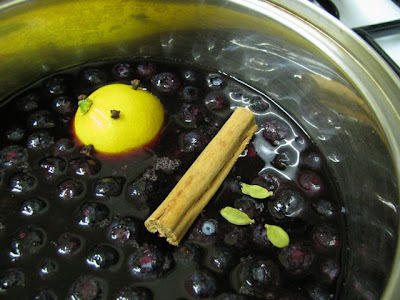 Place this along with the blueberries, pomegranate juice, maple syrup, cinnamon stick (in a muslin bag), cardamom and nutmeg to a medium saucepan. Bring to the boil, reduce the heat and simmer gently for 10 minutes. Remove from heat. Discard the cinnamon stick, cardamom pods and lemon with cloves. Use a hand held blender to puree the soup. If the cinnamon stick was not in a muslin bag you might want to sieve the soup. Dissolve the cornflour and water and add to the soup. Return to heat and stir til soup thickens slightly. If using cointreau, stir it in now. Serve in mugs with a dollop of yoghurt. 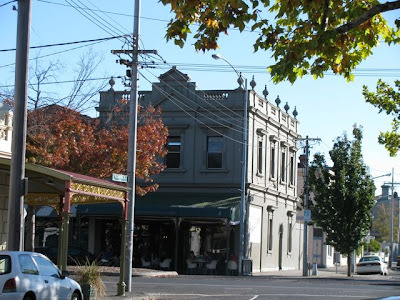 After I posted about the Paragon Chocolate Orange Cake recently, Cindy asked if you could still buy a slice of it at the Carlton Paragon Café in Rathdowne Street, North Carlton. It is so long since I have been there that I couldn’t tell her. But the wonderful cake filled me with nostalgia for my student days when I frequently visited the café. As it happened, we had to visit Rathdowne Street soon after so I was able to seek some answers. Last year I wrote about how much I love Rathdowne Street in the autumn. 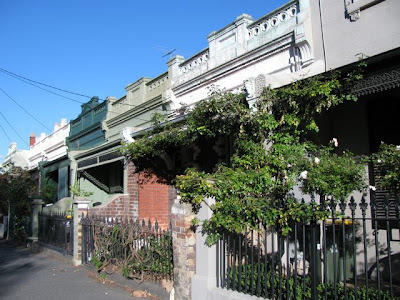 This year the autumn trees were aglow and the terrace houses gleamed in the sunshine as we headed off to the Paragon (actually the photo of terrace houses is on Newry Street where we like to park the car). I had Sylvia in a baby pouch and she slept the whole time. It’s been a while since we went out for brunch so it was all the more pleasurable to take the weekend newspaper and do the Samurai Sudoku while E nursed his coffee. One of the reasons I loved the Paragon was that it had a sophisticated ambience. It was always buzzing with a crowd filling the room of eclectic ornamentation. The café was quieter than I remember it, which may be because we arrived for brunch in the middle of the afternoon (and ordered 5 minutes before they finished serving the breakfast menu). But I still marvel at the decor. The Paragon is a spacious café with big windows for people watching. The lights are art deco wonders and angels trumpet on the wall opposite you upon entering. 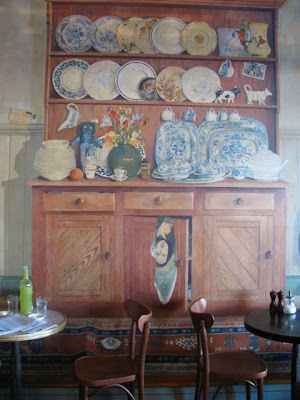 But most impressive is the trompe-l’oeil mural to your right. I love all the little details in the dresser such as the Mona Lisa teatowel hanging from the open door. Although I have fond memories of going to the Paragon Café as a student I think we mostly loved the cake and pondering over how the name originated. I don’t remember eating other food there. The current menu didn’t excite me much. The breakfast menu was mostly full of egg dishes and the rest was the old-school style Carlton menu of pasta, risotto and meat. Not much to tempt a vegetarian with an egg aversion. And it doesn’t offer much competition to some of the more modern places that offer fresh juices and dense sourdough bread, as well as interesting vegetarian dishes. However, we were able to find something to satisfy. 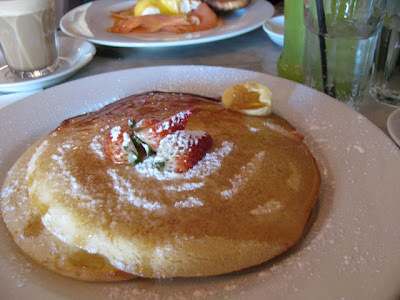 As I have mentioned before, I always love pancakes for brunch. I chose the pancakes with butter and maple syrup. E had the paragon eggs (which had salmon). He enjoyed it but looked at my pancakes with envy. My pancakes were light and fluffy and deliciously decadent drowned in maple syrup. Some berries or stone fruit would have been nice but it is not summer any more so I can’t really expect that. They were filling enough that I was happy to leave a substantial amount for E who loved them. The Paragon used to be the pretentious youngster of Rathdowne Street in my student days. Nowadays it is an old dame who has known better days but still retains her dignity. As we left I surveyed the tempting cake display and failed to find the chocolate orange cake. I asked a waitress if they still served it and got a vague ‘not sure’. So a fine brunch but no answers on the cake! I went to my sister’s for dinner the other night and her partner offered to rock Sylvia in her pram. He was so gentle I had to tell him that she needed firmer rocking. So much about bringing up a baby is a matter of ducking and diving around conflicting advice and going with your own intuition but some of it is counter-intuitive. Rocking a baby hard, patting a baby hard or even wrapping a baby in a swaddling cloth to sleep are against our instincts. Yet they work. In the same way, using preserved lemon seems counter-intuitive. When I first started using it, quite recently, I was surprised to find I had to rinse it first and to discard the flesh. The idea of throwing out the flesh and eating the peel just seems wrong. Then once you have done this, the taste is so weird – quite salty and bitter. But a little of this in a stew or salad adds a distinctive and interesting flavour. My first attempt recently at using preserved lemon was a stew that seemed a combination of a chickpea salad and a silverbeet sauté that I made last year. I also added lots of cauliflower, which I love. The stew was nice but a bit overwhelmed by the lemon. It was rescued the second night unexpectedly by adding a good handful of grated cheese. The notes of what I did are below. 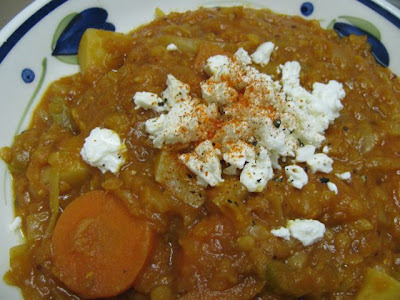 After this stew, I saw Jules recipe for Red Lentil and Preserved Lemon Soup on Stone Soup. It seemed similar to my recent tomato lentil soup but the flavours were so different that I had to try it. One appealing aspect of the soup was the addition of fennel seeds which I was sure lingered somewhere in the pantry unused. I spent much time searching and discovering all sorts of treasures at the back of my spice shelf but no fennel seeds. In the end I decided to substitute mustard seeds. By the time E came home from work, I was far behind in making dinner, thanks to my turning the spice shelf upside down. By then Sylvia was cranky, Zinc wanted me to come outside to play and I was feeling a bit ragged. As E walked in the door I thrust Sylvia at him and asked him to hold her while I chopped the last few vegies. These vegetables were chopped larger than usual in my hurry. Once that was done I could let it stew while I attended to our wee girl. 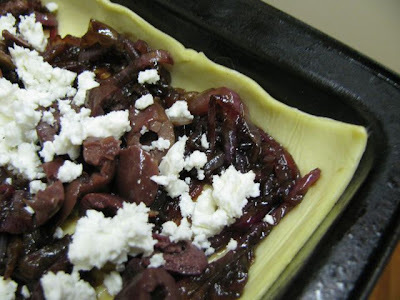 One of the reasons I made the soup was that I had some leftover feta from making the Red Onion, Feta and Olive Tart. The soup seemed to have a middle eastern flavour which would welcome feta. I forgot to put cayenne pepper in it so I sprinkled a bit on top of the feta. I made a few other changes to the seasoning and vegetables. But mostly I was concerned that the mustard would not complement the other flavours. I need not have worried. The soup was hearty, spicy and delicious. E was very impressed and we both had a second helping because it tasted so good. I am sending this red lentil and preserved lemon soup (the more successful of the two stews) to Lori Lynn of Taste with the Eyes who is hosting this month’s My Legume Love Affair: the eleventh helping of the event, which Susan of The Well Seasoned Cook founded. Heat oil in a stockpot over a medium heat. Add onion and cook 5 min stirring occasionally until the onion is soft. Add garlic, ginger and spices and cook for a couple of minutes. Then add the remaining ingredients, bring to the boil, cover and simmer about an hour. Stir occasionally to stop it sticking to the bottom. Add more water if it is starting to dry out. Remove bay leaves. Taste and season. You can blend this soup but it was quite thick so I didn’t bother (and neither did Jules). 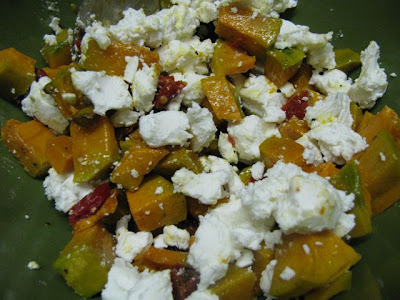 Serve with feta cheese or yoghurt. * We found the stew very lemony on the first night when I served it without cheese – so in future I might use less lemon juice and/or preserved lemon. Fry onion in oil for about 5 minutes in a large frypan. Add garlic and fry another minute. Add cauliflower, silverbeet stalks, chickpeas, tahini and chilli paste. Cook about 20 minutes on a low to medium heat (I cooked the cauliflower for 20 minutes and another 10 once I put the stalks in but I think this was too long). Add silverbeet leaves, lemon juice, preserved lemon, soy sauce, agave and water. Simmer for about 10 minutes. Serve hot and sprinkled with cheese. It goes well with rice. Every now and again, I use up leftovers and find the resurrection dish better than the original. 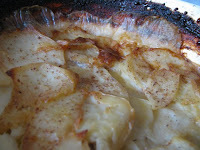 I am in search of a perfect creamy potato bake and was taken with a spiced one. 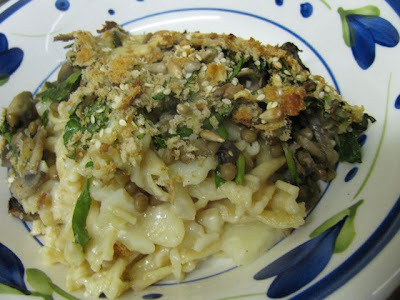 It really was not that great on the first night but the spices seemed to mingle nicely overnight and so I ended up with an interesting creamy pasta bake with potatoes, mushrooms, lentils and spinach as well as notes of cloves and nutmeg. An unexpected delight! I will never forget doing one of these potato bakes – you know the one when you thinly slice the vegetables and bake them in milk or cream – when I had just moved into my first share house. It took hours and we were starving by the time it was edible. I kept taking it out of the oven and poking a knife into it quite regularly, willing it to feel soft and yielding. But it seemed to constantly have that unwelcome crunch that needed returning to the oven. 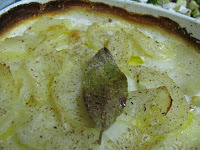 As I have been thinking about this potato bake, I thought I would share some ideas. One from my mum was to cook the potatoes briefly in the microwave before slicing. She also suggested heating the milk first and adding onion. 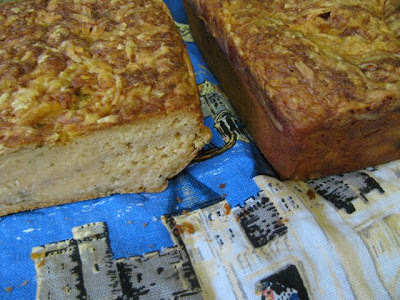 Lorraine of Not Quite Nigella has an interesting potato and zucchini bake in which the potatoes are simmered in the milk first and then baked. She also used a large shallow roasting dish for lots of crispy topping. I also liked a similar recipe in The Age newspaper on the weekend that had grated cheese sprinkled between layers of potatoes. The potato bake that I made tasted just like milky potatoes the first night. Perhaps it was extra milky because I had a few less potatoes than the recipe called for. But after I served it I left the remains in the oven another hour and then turned off the oven and left the dish to cool. So the next day the spices were more prominent and the milk had turned beige and creamy. But it was too rich to eat alone so I concocted a pasta bake. I was most impressed with my pasta bake. I was going to mix all the ingredients together but was not sure any of my mixing bowls were large enough so I had layers. I loved the indulgent creamy pasta and potato with a layer of healthy vegetables and lentils, all topped with crispy cheese, breadcrumbs and seeds. I served it with tomato sauce. I have had a stab at a recipe below but I do not advise you cook potatoes in milk for hours just to make the pasta bake unless you have oodles of time. However, if you do have some leftover creamy potatoes, I highly recommend you use them in this way. In fact, the thought of making this pasta bake again makes the search for the perfect potato bake all the more attractive. I am sending this pasta dish to Sara of I'm a Food Blog who is hosting this week's Presto Pasta Night (#115), an event founded by Ruth of Once Upon a Feast. Grease a baking dish with the butter. 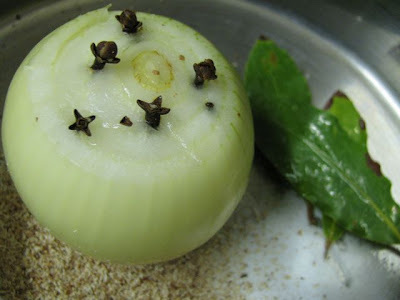 Remove and discard onion, cloves, garlic and bay leaves from milk. Arrange potato slices in dish and then pour milk over them. I used a dish about 23cm square but I think I would use my large roasting dish in future. Cook pasta according to instructions on packet. When cooked, mix with potato gratin and 1-2 handfuls of grated cheese. Meanwhile, heat oil in large frypan. Fry onion for about 5 minutes or until starting to soften. Add garlic and mushrooms and fry until mushrooms soften – about 5-10 minutes. Add spinach and stir briefly until it starts to wilt. Remove from heat and add lentils, balsamic vinegar, smoked paprika and cayenne. Grease a large baking dish (I used my roasting dish) and place a layer of the potato and pasta mixture and a layer of the mushroom spinach mixture. Sprinkle with 2 handfuls of grated cheese, breadcrumbs and seeds. Bake in 220 C oven for about 30 minutes or until topping is golden brown and crispy. Thank God for dirty dishes. They have a tale to tell. While others may go hungry we're eating very well. With home, health, and happiness, I shouldn't want to fuss; By the stack of evidence, God's been very good to us. I had never heard it before but I love the sentiment of dishes telling the story of the meal. Our dishes from last weekend would have displayed a confetti of pastry flakes in a smear of vinaigrette. I guess, that tells is of a cook who likes to indulge and try to stay healthy at the same time. Isn’t that the story of my life! In fact, I don’t often cook with puff pastry because I think it will be heavy but the red onion, feta and olive tart that I made was quite light. Possibly because it wasn’t so full of cream and eggs but also it might be that, because I used ready-rolled pastry, it was only half the weight of that suggested in the recipe. By the way, I always thought puff pastry was made with butter and was surprised that our supermarket has a special ‘butter’ puff pastry. I bought this because it had half the ingredients of that in the regular puff pastry. 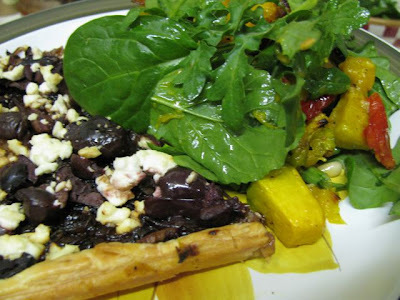 I found this recipe for Red Onion, Feta and Olive Tart in the BBC Good Food Magazine cookbook called 101 Veggie Dishes. I first made it a few years back when friends came over for dinner. Served with a pumpkin and tahini salad, it went down a treat. Tarts seem like great food for entertaining because they make an attractive centre to a meal and a buttery pastry always seems indulgent. 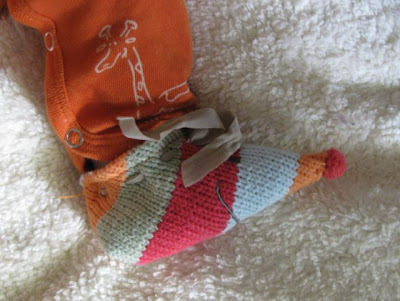 The BBC website also suggests these would make good appetisers if cut into smaller pieces. When I finally managed to make the tart again last weekend, I was a little concerned that the reality spoil the memory. Perhaps I only loved it because we had a great night with Kim and Jo. But it was every bit as delicious and appealing. 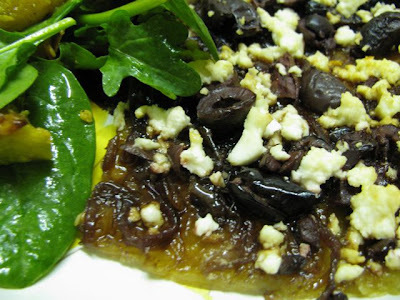 The sweetness of the caramelised onion and salty olives paired perfectly. The darkness of the onion and olives contrasted pleasingly with the white feta. The pastry was light and flaky. It is easy to make and reheats nicely if you keep leftovers for a second night. The recipe says to serve it with a green salad but I felt the meal needed more vegetables. I made a salad a bit like this one. On the first night I served it with rocket, baby spinach, roasted pumpkin, sun dried tomatoes and pinenuts. 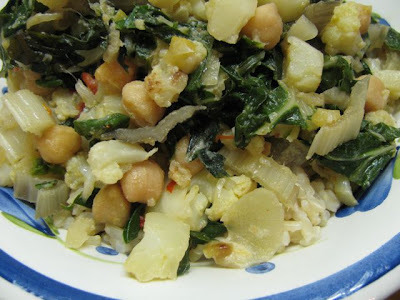 The second night I felt the salad needed more oomph and added chickpeas. I noticed that Johanna of the Passionate Cook is hosting Waiter There’s Something in My … Event and this month the theme is Bistro Classics. 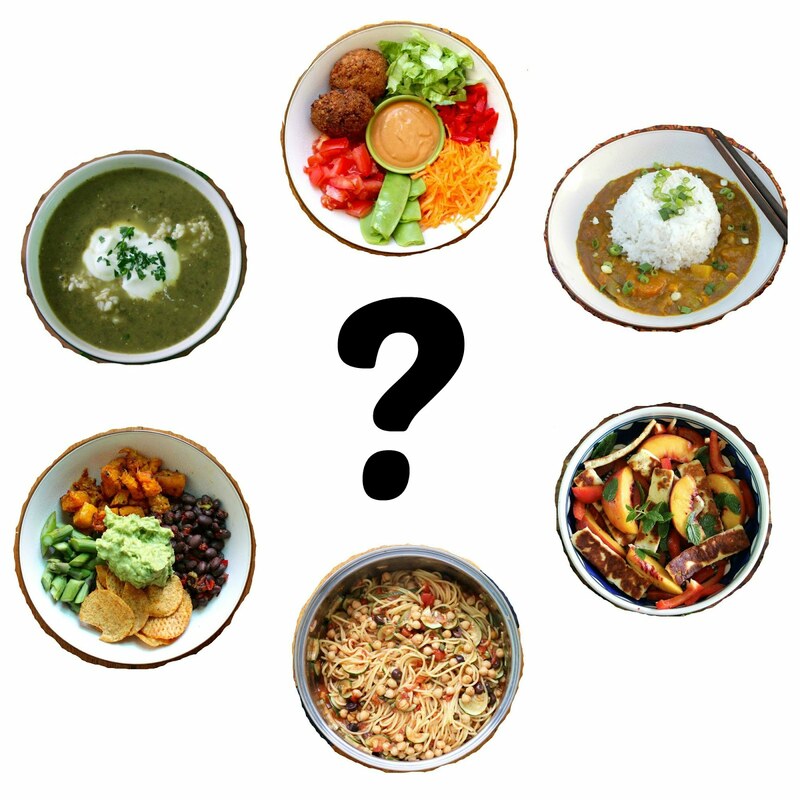 She describes the food as ‘simple, hearty and bursting with flavour’. I am not sure how hearty this tart is but it is simple and flavoursome, and so often vegetarians are offered pastry dishes when eating out in cafes and pubs that I thought this was appropriate. Melt butter in a frypan and fry onion in it for about 10-15 minutes with a pinch of salt until onions are soft and caremalised. Stir in sugar and vinegar and simmer about 5 minutes until the liquid thickens slightly and becomes syrupy. Cool slightly. Roll out pastry (if your pastry isn’t ready rolled) and line a greased 30 x 22 cm swiss roll tin. Spread onion mixture on pastry. Scatter olives and feta over the onions. Drizzle olive oil over the tart. Bake for 15-20 minutes (it took me 30 minutes) until pastry is golden and puffy at the sides. Serve hot with salad. A walk down the aisles of any supermarket will find us spoilt for choice. In fact it is a tyranny of choice. 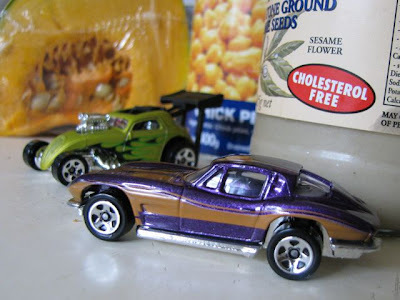 Years ago a trip to buy dips and chips was easy. For example, when I was little we had three flavours of chips (or crisps) in the local milk bar – chicken, salt and vinegar and plain. Everyone had their favourite. Mine was (gulp) chicken. Now we head off to the supermarket in search of lime and black pepper or morrocan seasoning chips and – ooh, aah – we spy a new line of roasted garlic chips. Must try those. We are now a nation of fickle consumers. Where is the loyalty? Unfortunately loyalty is becoming a thing of the past in processed foods, just like last year’s taste sensation. We are forever being tempted by the new and creative. It is all well and good if we just want to be seeking the elusive best ever But what if you arrive at your favourite and find it is just a fleeting fad. We never had dips when I was a little tacker but when I moved to Melbourne as a young university student, wide-eyed in wonder at all the fabulous cafes, dips became all the rage. There were a few you would expect to encounter everywhere – hummus, tsatsiki and baba ganoush. Interestingly, these dips still feature heavily in cafes but the supermarket shelves of dips have become overwhelming in their variety. Beetroot, pumpkin, rocket, pesto, carrot, lentil, sweet potato, spicy, nutty, cheesy. Like chips, fashions come and go in dips. 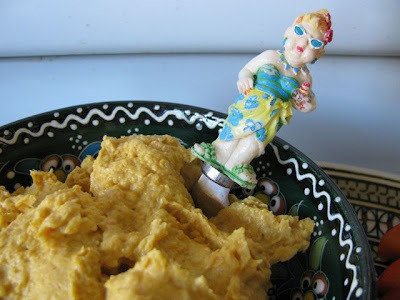 Ricki recently posted about curried pumpkin hummus and I was reminded of the pumpkin hummus I used to buy regularly. It was one of my favourites but it seems others did not share my enthusiasm. Or maybe it just had to go to make way for the new flavours. Anyway it disappeared from the supermarket shelves without explanation. I miss my pumpkin hummus and so I was inspired by Ricki to make some. As I buy my pumpkin raw, I decided to roast it for more flavour. I had plenty of garlic about so I also roasted a bulb of that while the oven was on. I didn’t add any oil because the pumpkin, with the little oil used for roasting, gave enough moisture. The resulting pumpkin hummus was delicious and creamy. It was full of deep warm flavours without the bite usually found in dips with raw garlic. It lasted well for about a week without becoming watery as dips often do. I enjoyed it for lunches with fresh vegetables and corn thins. In fact, it was better than the stuff I was buying from the shops. Not as convenient but a recipe is forever, unlike a new flavoured processed food! Place the pumpkin in a roasting tray and toss with the oil and seasoning. Chop the top of the garlic bulb off and place on a large square of foil. Drizzle a little olive oil over garlic and bring the foil up to make a little bag that is sealed at the top, enclosing the garlic. Place garlic in the same tray as the pumpkin. Roast in 200 C oven for 30 minutes. Remove garlic and cool a little. Roast the pumpkin an additional 15 minutes. When garlic is cool enough to handle, unwrap from foil and squeeze cloves out of the peel and discard peel. Place pumpkin, garlic and remaining ingredients in a food processor and blend til smooth. Check seasoning and adjust as necessary. Update: Sept 2011 made these with carrot instead of pumpkin - roasted carrot about about 200-220 C for about 1 hour until it was starting to blacken on the outside but soft inside - fantastic! 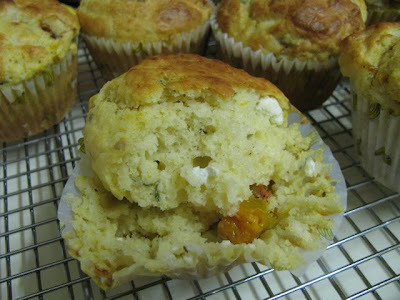 Since starting blogging, I have got braver at using fresh fruit in muffins and in creating my own recipes. I look at what other bloggers do with recipes and realise I am not held hostage by what is written on the page. It is quite liberating to make the recipe fit what is in the house rather than running around the shops at the beck and call of the cookbook. For example, recently I had a couple of pears in the fruit bowl that were threatening to go mushy before I could eat them, so I decided to make muffins with them. 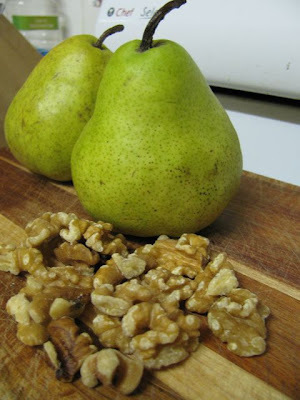 The combination of pears and walnuts was inspired by seeing them paired in a chutney recipe. 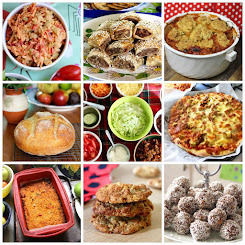 I checked my cookbooks for ideas and cobbled the best bits together. The resulting muffins were a wee bit moist but tasted great. They were best warm from the oven but were getting on the soggy side the next day. I took them along to a gathering at lunchtime and they were quite welcome. But when I got home I put them in the freezer and since then have been taking them out and popping them in the microwave when I want one. So if I was to make this recipe again I think I would add a bit more flour or bake them a little longer. These muffins are not that pretty to look at – though some fun polkadot muffin cups were helpful. But they are pleasingly spicy with the nice contrast between the soft sweet juicy pear and the gentle firmness of the walnut. Perfect for snacks or entertaining. Mix dry ingredients in a large bowl. Use a whisk or fork to lightly blend wet ingredients in a small bowl. Add to dry ingredients and gently mix till just combined. It should be quite a stiff mixture because the pear will make them moist when it cooks. Spoon into mini muffin tins (either lined with muffin cups or greased.) Bake 20 minutes at 180 C.
We had some visitors a few weekends back. It was a great excuse to bake a chocolate cake so I could be the hostess with the mostess. Actually, these days when I have visitors, I am usually so busy with Sylvia that I forget about offering a cuppa but fortunately E is always quick to put on the kettle. I had been wanting to try a chocolate cake made by Heidi from 101 Cookbooks. It is what she calls a ‘basic’ chocolate cake but I think it is far from it. For a start it has a cup of maple syrup instead of sugar. 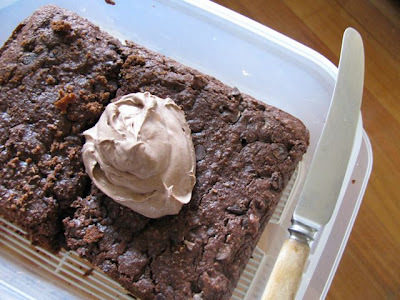 This is both a delicious and healthy alternative sweetner but not a cheap one and not one I would ever have considered when making my mum’s basic chocolate cake in my youth. It also has coconut milk, which is unusual but a great dairy-free alternative. I made a few changes to the recipe. 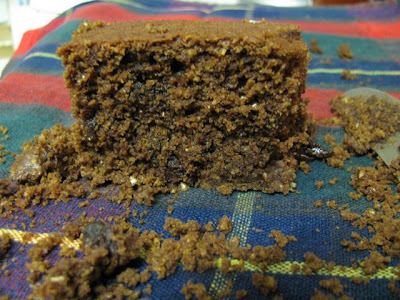 I added a bit of wattleseed and cinnamon for added depth of flavour, and I used choc chips instead of chopped chocolate. My most noticeable change was to use a different frosting. When making the cake I had a CRAFT moment (ie Can’t Remember A Flaming Thing). I tipped the mixture into the cake tin and remembered I hadn’t added the choc chips so I gently stirred these into the mixture while in the tin – but I don’t recommend this to anyone unless you are as forgetful as me. Preheat oven to 180 C (350 F). Grease and line a 23 x 23 cm square cake tin. Place the flour, cocoa powder, baking powder, spices and salt into a large mixing bowl. In a separate medium bowl mix together the melted butter and maple syrup. Add eggs vanilla and coconut . Use a fork to lightly whisk these wet ingredients together and then add to flour mixture. Stir until just combined. 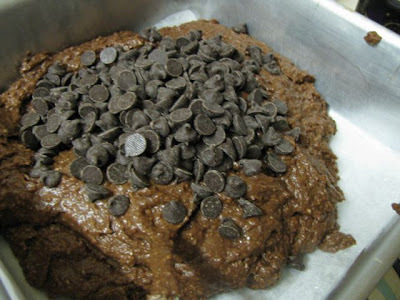 Add chocolate chips and fold in to the mixture. Pour mixture into prepared cake tin. Bake for 30-40 minutes (it was 30 minutes for me). Heidi suggests it is ok to be slightly under-baked and I agree. So the skewer needs to come out of the centre of the cake almost clean to show cake is ready to come out of the oven. Heidi also says to cool in tin but I turned out onto a wire rack to cool after about 10 minutes. 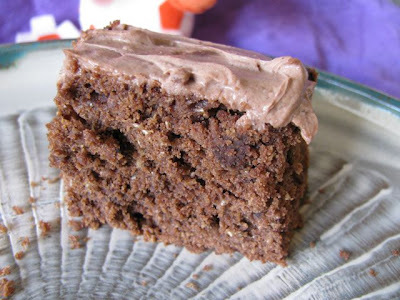 To make frosting, mix all ingredients in a small bowl with a spoon til creamy. 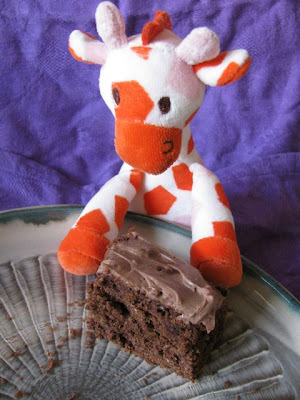 Spread frosting over the top of the cooled cake. Blogging: so many great ideas and so little time. So it is always a pleasure to actually make the food I drool over rather than just dreaming about it. 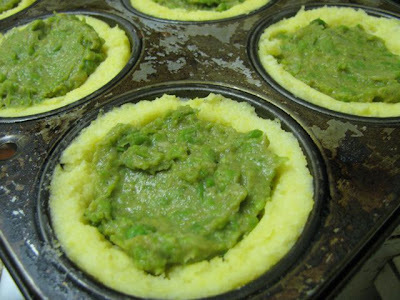 I made these polenta cups with pea puree just a few nights ago. I had seen Kristy post about polenta cups only the day before and was excited about the idea so I wanted to share it. Kristy had made polenta cups with smoky bean chilli filling but she had got the idea from Rachel Ray who had baked them with an egg inside them. It seemed such a brilliant idea that I wish I liked eggs. 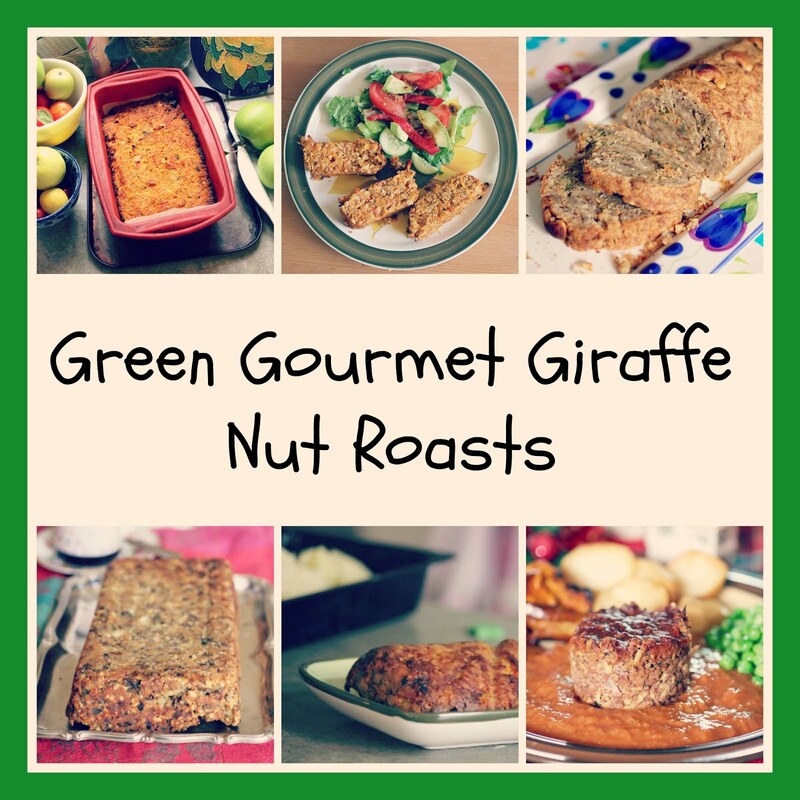 Fantastic for gluten free diets! 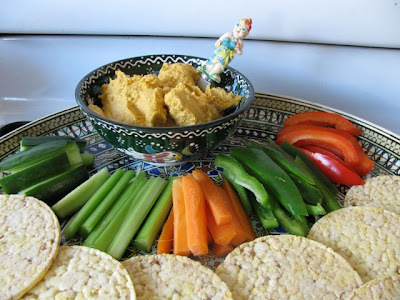 I had been thinking about making a green pea and bean spread inspired by these dips. This appealed to me as a filling for the polenta cups. My other inspiration was Ashely at Eat Me Delicious. 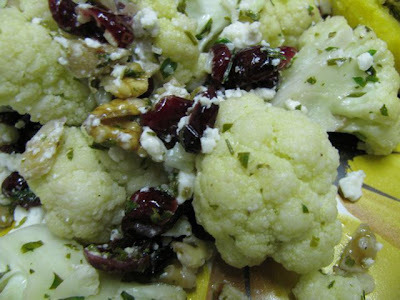 She had recently made a Herbed Cauliflower with Capers and Lemon. What interested me was her comment that she enjoyed it with quinoa, cranberries, feta and walnuts. What a combination! 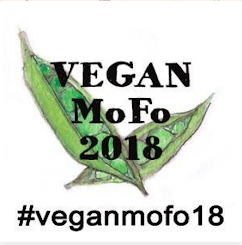 It appealed even more when Lisa announced the theme for the No Croutons Required Event that she and Holler organise each month. This month it was to be a soup or salad with berries. It is not berry season here so I drew a blank. Then I thought that cranberries would fit the bill and it gave me the perfect excuse to try a version of Ashley’s salad. 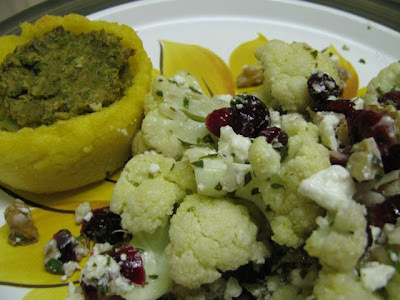 The polenta cups and cauliflower salad paired wonderfully, tasting both delicious and healthy. By the time the cups came out of the oven we were hungry. Even a gentle knife to lever them out of the muffin tins was too harsh for these soft cups. The first one out collapsed completely. The second wobbled like the bottom lip of a baby about to cry, but it held together enough for photos. Leaving them for 20 minutes till I prised them from the muffin tin and then baking them another 20 minutes made them just the right crispiness and shape (as you can see on the photo). I am not sure how this extra baking would affect an egg in the polenta cup but it worked fine with the puree. 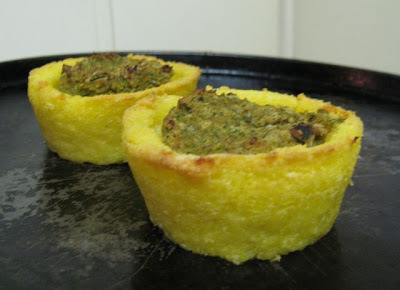 Now that I have discovered these polenta cups, I want to try them in other ways. The possibilities are endless. I am interested to try them in my silicone mould mini muffin cups. I think they might come out easier that way. Another idea is to put them in cupcake papers. 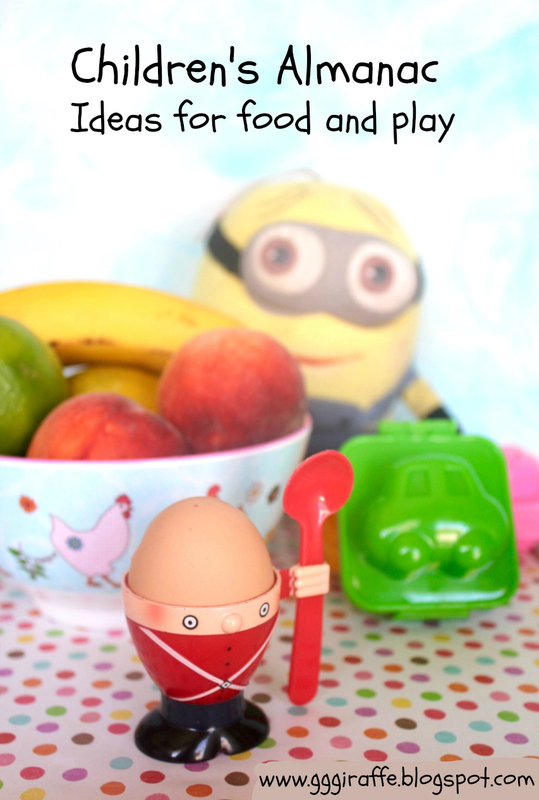 They would be a great for entertaining or lunchboxes – actually I had one cold for breakfast and it was great. Rachel Ray served hers with egg in the cups and sausages on the side. I would like to try these with quiches or chlli non carne. I have even wondered about a sweet version with custard or berries. 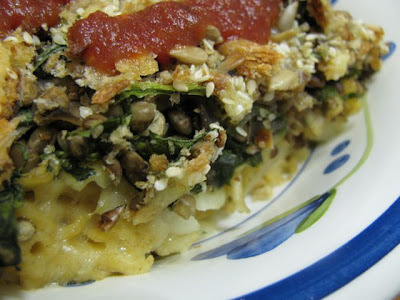 Making polenta is so easy since I have started making it in the microwave and, since my niece was diagnosed as a celiac, I have been interested in gluten free recipes. The salad was also gluten free, as many salads are. More importantly, it was delicious and seasonal. 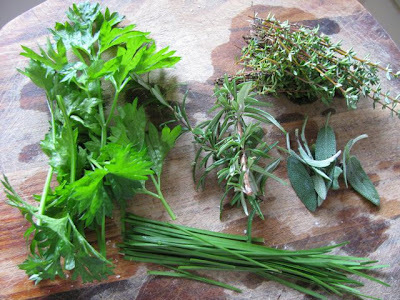 I used some herbs from the garden. I was not brave enough to include capers. 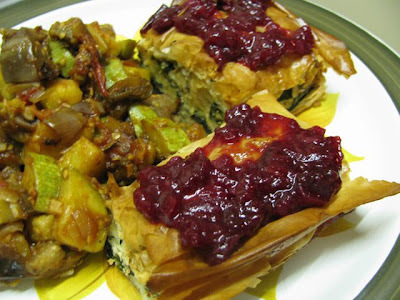 I don’t use capers much and was not sure they would taste right with the cranberries, feta and walnuts. I also didn’t do the quinoa that Ashley suggested because I wanted to keep it simple, but with quinoa this salad would be more substantial. But the salad, with the polenta cups, makes a most pleasing meal. * other grated cheeses would work well too - or omit cheese to make vegan. Microwave polenta and stock (or water and salt) for 3½ minutes – stirring every minute till a porridge consistency. Stir in parmesan cheese. Check seasoning. Spoon into greased muffin tray (mine made 7-8 cups). Use back of spoon and/or fingers to mould into cups. Set aside. Make pea puree by blitzing all ingredients in the food processor. Fill the polenta cups with pea puree and smooth on top with the back of a spoon (Use leftover puree as a spread if you have any). Bake in 220 C oven for 20 minutes. Remove from oven and sit for about 20 minutes. Carefully remove from muffin tray with a knife. Place on greased tray and return to oven for 20 minutes or until crisp on the outside. Serve warm or room temperature with salad and chutney. 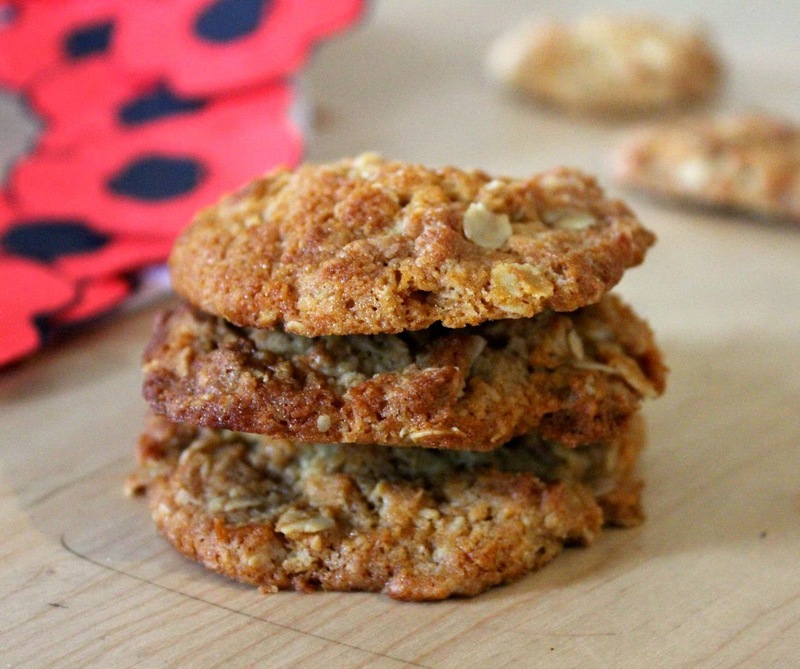 These would be good as part of a buffet, for breakfast or in your lunchbox. Steam cauliflower (I did it in the microwave) till tender. Toss with remaining ingredients and serve warm or at room temperature. My daughter is a night owl – just like her parents. She sleeps so well in the morning and gets worse and worse as the day goes on. By evening both Sylvia and I are usually cranky. She wants to feed. I want to blog. I shouldn’t complain too much. She slept till 10am on Saturday. But this was after going down to sleep at 2am. I told someone about this sleep-in and they asked if I was waiting to feed her. Of course I was sleeping while she was. Last night she went down at 12.30am which is an early night for her. I feel a wee bit shamefaced about this whinge. Here I am with a beautiful daughter (who sleeps 7 hours most nights at the age of almost 12 weeks) and we eat very well. Yet I want more. Just a little extra time to blog. I have the photos and recipes for many meals but I need time to pull it all together. Too many days I feel foolishly optimistic. I am so sure I will be able to write a post and then there is the wail from the cot. I had thought I might be able to get this post written on Sunday for Mother’s Day but it is now Friday. I was determined to finish it in the morning but it is now afternoon and I am still writing it. The days seem to pass all too quickly. Last week I had one of those days when even making dinner was a struggle. We had a dodgy leaking tap and called the plumber. My mum rang to see how I was doing. 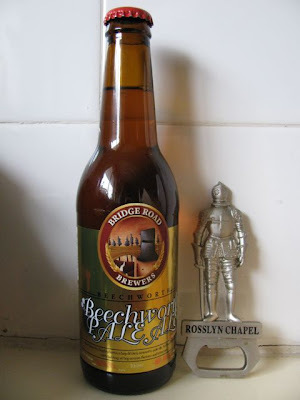 ‘Mum,’ I said, ‘The plumber is looking for the stop tap, E is visiting a neighbour who was mugged, I am feeding Sylvia and am midway through making dinner!’ Earlier that day I had been to the liquor superstore to buy beer for baking and I knocked over a bottle which broke and splashed all over me and the pram. Great, I thought, now I smell like a boozy mother! Fortunately the soup I was making for dinner was easy and able to be paused while I was distracted by other things. But the three cheese and beer bread I had planned to bake just was not possible on that night. The next day I was determined to bake the bread and started in the morning when Sylvia was sleeping. I put it in the oven and went off for my shower. It all seemed to be going without a hitch until I checked the oven temperature. I accidentally had the oven on 150 C instead of 180 C. This was followed by a lot of angst in trying to get the bread cooked. Finally I had to go out and took it out, despite the skewer not coming out cleanly. The soup and bread were both hugely enjoyed. This was all the more satisfying because I had altered both recipes. 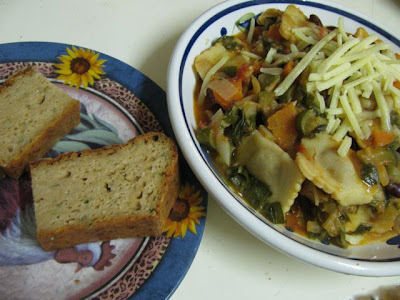 The soup was inspired by Nava Atlas’ Swiss Chard Stew with Tortellini and Sun-Dried Tomatoes. I changed the flavouring, added more vegetables and beans. I love ravioli and was pleased that using it in the soup made it last longer than just adding some tomato sauce and broccoli. The bread also was slightly altered as I didn’t have the right ingredients. I substituted oatbran for flour on a whim because I found some oatbran that had been in the pantry too long, and when I went to use wholemeal flour I found the container almost empty. I didn’t have buttermilk so I used milk and lemon juice. (Ironically, I originally had planned the bread to use up yoghurt but by the time I baked it, the yoghurt was smelling dodgy and had to be binned.) 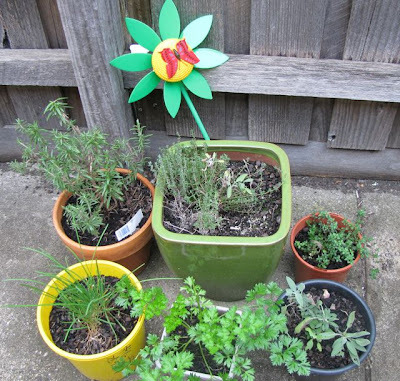 And I used fresh herbs from the garden because they were there. When I got home I found that my mum had filled the tub that I took the bread down in. I took a photo which doesn’t show it in its best light but gives an idea of it. It was full of quiche, some cheese and beer bread, scones, little gluten free cakes, and a wonderful date and pistachio slice. After a day with the family, I was glad to have her offerings for dinner. I thought Mother’s Day was a good opportunity to celebrate my mum but I want to extend my admiration and gratitude to all women. Not all women are mothers in the narrow sense that greeting card companies dictate. But I have received the gifts of inspiration, teaching and nurturing from grandmothers, aunts, sisters, friends, colleagues, bloggers and strangers. I much prefer the term Mothering Sunday to Mother’s Day so we can celebrate what all women give to others. 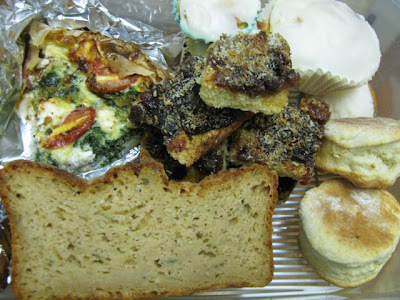 I am sending the three cheese and beer bread to Poornima at Tasty Treats who is hosting this month’s My Favourite Things Event, which was started by Bindiya. The theme is All Things Cheese. Heat olive oil in stockpot. Fry onion, garlic, carrots and celery on low heat for about 10 minutes. Add water, stock powder, tomatoes, kidney beans, zucchini, tahini, herbs, bay leaves and spices. Simmer for about 10 minutes. Add ravioli and silverbeet stalks. Simmer for another 10 minutes. Add silverbeet leaves and simmer 5 minutes. Add semi-sundried tomatoes and heat another couple of minutes. Remove bay leaves. Serve with a handful of grated cheese on top if desired. Preheat oven to 220 C. Grease and line 2 loaf tins. Mix the cheeses and set aside 1¼ cups of cheese. In a large bowl combine the flour, oatbran, baking powder, salt, mustard, herbs and remaining 4¾ cups of cheese. Mix to combine. In a separate bowl combine the beer, sour cream, tomato juice, eggs and worcestershire sauce and lightly whisk together. Add the liquid to the dry ingredients and mix till just mixed. Do not over mix. Mine was quite a soft mixture. Pour the mixture into prepared loaf tins. Sprinkle the cheese that you set aside earlier. Bake at 180 C for 50 -55 minutes or till done (mine were in at 150 C for 40 minutes at then another 50 minutes at 180 C at the bottom of oven – not recommended!) Allow to cool in the tins for 15 minutes before turning out onto a wire rack to cool. I have been making lots of smoothies lately but nothing worthy of posting. 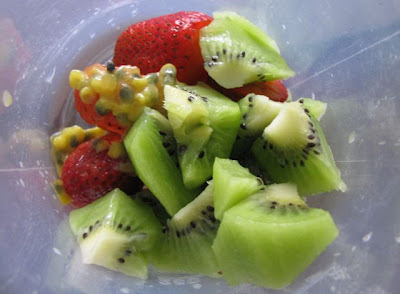 Most are banana, berries/kiwifruit and milk. I even added half an avocado to a recent one. Most of the smoothies I have posted don’t have milk but lately I wanted to increase my calcium intake. However this morning I felt like a milk-free smoothie. My mum had given me a punnet of strawberries which had grown a beard. I could only rescue about four. There was no juice in the fridge, no banana in the fruit bowl and my strawberries needed to be used pronto. What to do? Then my eye fell upon a tin of peaches in the pantry. Perfect. This smoothie brought a breath of summer into this cool autumn morning. The only change I would make next time would be to use a whole punnet of strawberries if they were not mouldy. If it was summertime and I had a ripe peach or two, then I would use those and a little juice. In fact my tinned peaches are in apple/pear juice if you read the small print. 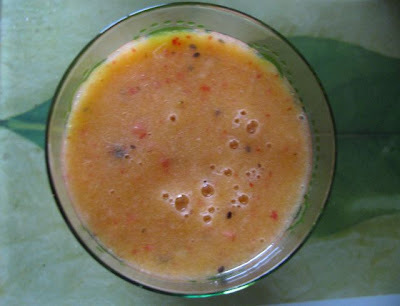 But I was very happy with this refreshing smoothie and the pretty flecks of colour in it. In fact, you might say it was just peachy, if you excuse the pun. Blend (I use my handheld blender in a tall jug) and drink. A few weeks back I had my first swim since Sylvia was born. I’ve missed swimming. I love the smell of chlorine. I love being in the water. And I realised I have come to love the peaceful time while tootling up and down the lap lanes when I can think about recipes. During this swim I thought about pumpkin and goats cheese muffins. I have not been a big fan of goats cheese (ever since encountering some distastefully strong goats cheese in a café some years back). Then my mum recently brought me some delicious goats cheese that I used to top my mushroom and lentil ragout. 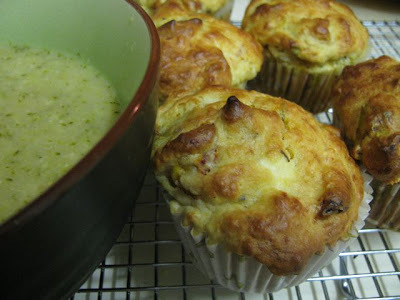 I envisioned chunky savoury muffins with fresh herbs from the garden. Almost a meal in themselves. Just like the ones at Arcadia Café in Gertrude Street Fitzroy. I thought the web would be littered with this sort of recipe but I couldn’t find any such thing. All the pumpkin muffin recipes I came across were sweet. So I looked at some recipes and cobbled together the muffins I had dreamt of. I love the depth of flavours that roasting imparts to pumpkin (and all vegetables). On the day before baking my muffins, I roasted the pumpkin with seasoning and olive oil for 30 minutes at 200 C and left it in the oven while it cooled. The pumpkin was stirred into the muffin batter in chunks. I baked in a rush to make the muffins before feeding Sylvia. In my hurry I used white flour instead of the wholemeal flour I had intended and I forgot to add oil. So I found the mixture a little stiff and just added a bit more milk. I was surprised at how soft and moist they were without oil. Everything tastes fantastic straight out of the oven but they also tasted great cold the next day. E told me the muffins were too wet with pumpkin chunks. He would only eat them warm out of the oven or heated up in the microwave. I thought the pumpkin imparted a wonderful flavour to the muffins. We both enjoyed them as an accompaniment to broccoli soup. In fact, I can recommend them for breakfast, lunch and dinner. *Or you can substitute ¼ cup oil for ¼ cup of milk which was what I originally intended. 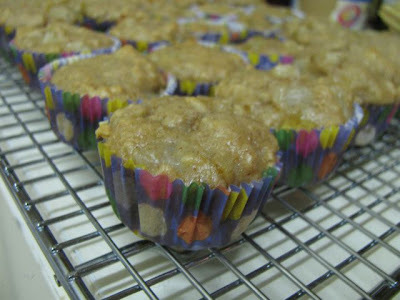 Place paper muffin cups in a muffin tray. Preheat oven to 200 C. Lightly mix all ingredients in a medium-large bowl, except the flour. Gently stir in the flour till it is just combined. Spoon into muffin cups and bake for 25 minutes. Cool on a wire rack. I rarely eat plums. Why? It’s a mystery. 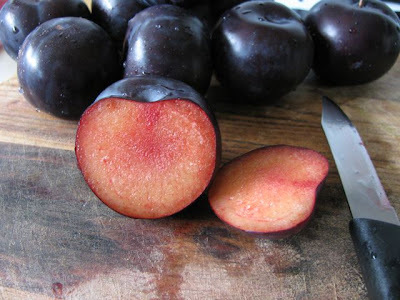 I love stone fruit and think plums are gorgeous to look at. Maybe it is because I have fond memories of blood plums that I ate as a child. Now I rarely see them in the stores and, when I do, they are soft and too sweet rather than tart and crisp. But I do love plum jam. 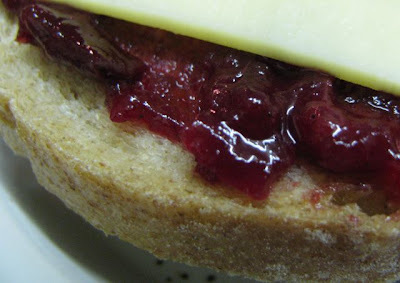 So it was no surprise to find a plum and apple chutney recipe that delighted me. I saw the recipe in the Australian BBC Good Food Magazine that my mum lent me (I promise I will return it one day, mum). I bought some plums that looked a pleasing hue. But then I struggled to find time and energy to make it. Not just the time to make sure I stirred it enough so it wouldn’t stick but also to prepare the jars. I finally made the chutney when my plums had sat in the fruit bowl a couple of weeks and I was beginning to worry they would go mouldy before I got a chance to preserve them. Isn’t it strange the things that motivate us! I only learnt to ride a bike when I was young because my mum told me if I didn’t use my new bike it would be given to my younger sister. I learnt to ride quick smart! I made it on the weekend when E was about and my dad was visiting. This was useful as I was able to ask them to help with frequent stirring when I was occupied with Sylvia. I hadn’t checked the weight of plums needed for the recipe so I needed to adjust measurements from the 1.5kg to my 600g of plums. I also found that mine took half the simmering time suggested by the recipe. The resulting plum chutney was a dark and brooding sauce (a little neofolk, said E) with spicy flavours that were not so strong as to obliterate the plummy taste. 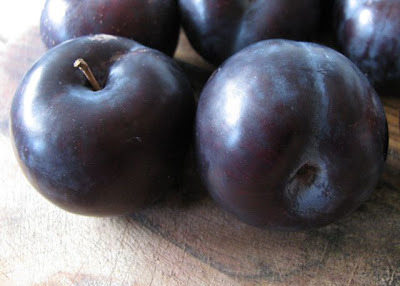 I have a photo of the inside of the plums because it is a mystery to me how such light flesh becomes such a deep purple colour. Maybe it is the dark skins with the blue-purple colour of a bruise? Whatever the cause, that is what I love about plum jam and plum chutney. Who can resist such a hue! When it was first made, I tasted the chutney and found it a bit rough textured with the finely ground spices. But once the chutney had sat for a bit, this odd texture disappeared. 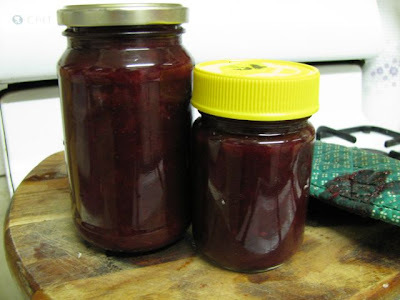 I found a recipe for plum chutney by Rita Erlich on the web. She suggests placing whole spices in a muslin bag while you simmer the chutney for a smoother texture. She also says to keep a couple of months before using. I am sure this is good advice but I am too impatient or disorganised. The recipe suggested it would make a fine accompaniment to venison. Not in my kitchen. We ate it with gusto with everything from cheese and bread to vegetarian sausages to the spanikopita that my mum made for us. It improves any food. We are on to the second and last jar now. I wish I had bought more plums so we could have oodles of bottles in the pantry for our pleasure and to give away for gifts. Maybe next year. 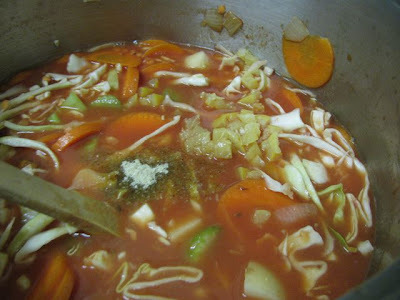 Place all ingredients in a large saucepan and bring to the boil. Reduce heat and simmer for 30 – 60 minutes (the recipe said 60 minutes but mine took only 30 minutes) till slightly thickened and syrupy. I poured some hot water over jars (using tongs to empty them in the sink) and let them air dry. I spooned hot chutney into the dry jars and sealed them straight away. I wasn’t too bothered about sterilisation because I knew it wouldn’t last long. (If I thought the chutney would sit around longer I would boil the jars for about 10 minutes in boiling water.) I made two jars and when I opened the second jar (which had been in the pantry) after 3 weeks (in which we ate the first jar) it was fine. Keep in fridge once opened.